In 2016, Soapbox Science came back to Manchester! 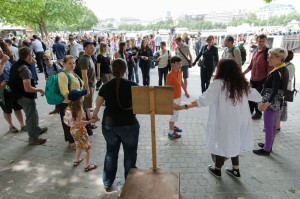 On 23rd July, 12 female scientists took to their soapboxes in Piccadilly Gardens, city centre Manchester, to demonstrate and discuss their research. Many came to be inspired by cool science from across the North West. We couldn’t run our events without the logistical and financial support of our sponsors. Since 2014, Soapbox Science is supported by the Science and Technology Facilities Council. The Manchester event is moreover supported by the University of Manchester and the Wellcome Trust. Ms Alba Maiques-diaz, CRUK Manchester Institute, is sponsored by Instituto Cervantes Manchester.